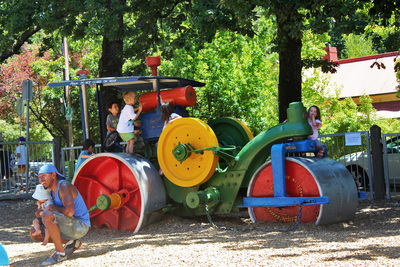 Steamroller Park gets it's name from the multi-coloured roller that has pride of place in the playground. It's also known as 'the Faraway Park' by a 4-year-old somewhere in Adelaide. We first visited this park with a friend who lives nearby in the hills, and after that there have been multiple enquires about the 'Faraway Park'. I like that name, it reminds me of The Faraway Tree, which was always my favourite group of Enid Blyton stories. Like the book, it's nice to see a playground that fosters imagination and creative play, because there are too many dull playgrounds around. The roller wasn't always as colourful as it is now. It stands in the park as a memorial of the late John Howard, the operator who worked in Stirling many years ago. The new paint-job helps it fit seamlessly into the park. 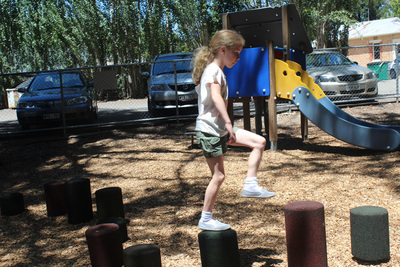 It's one of the most popular pieces of equipment, and there always seem to be kids hanging off it in every which way. 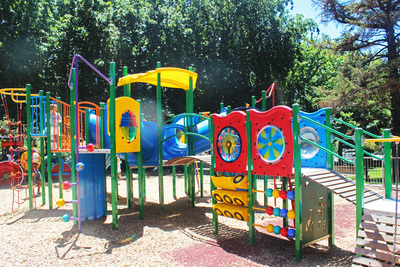 The actual play equipment is big, with tunnels, rock climbing walls, poles, bridges, slides, and more. 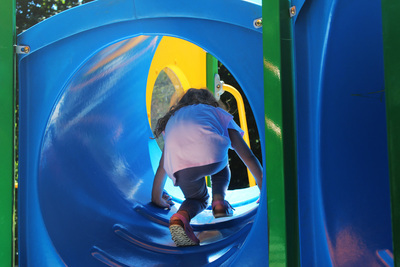 It's one that kids can actually explore, rather than just running back and forth over a bridge or two. It's bright, colourful, and fun. There's an area perfect for young children, that is off to the side. There are bouncers, and a charming little cubby house. Although it seems the most popular activities are hiding in the tree, or walking around the rubber 'rocks' that form a small circle. The playground is fenced off, and there are a few tables and chairs inside for parents who want to sit down. 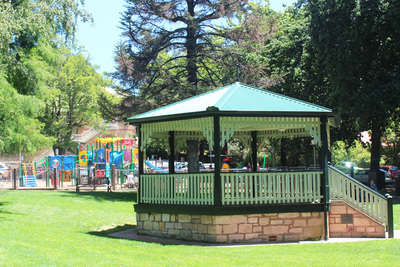 Outside is a grassed area with a gazebo, where you can play ball games or fire up the barbecue. Of course, there are toilets too. It's a good all round park, rather than just a playground. It makes it a good family spot rather than just somewhere to entertain the kids. 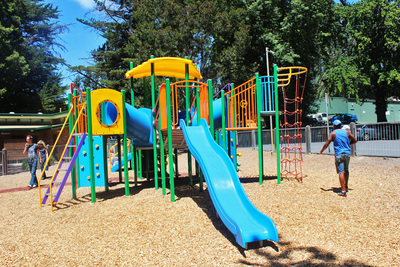 You can play some games with the older children on the grass, while the younger ones enjoy the playground. 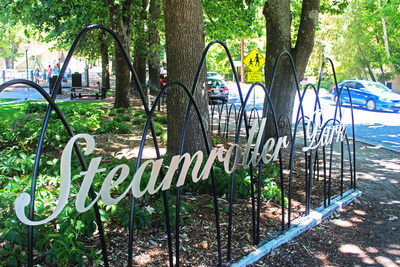 Have you been to Steamroller Park? Do your kids have a favourite place that is sometimes a little hard to get to?